Its Easter Saturday, the first Bank Holiday period since Christmas and New Year so everywhere will be busy, especially on such a lovely day like this. 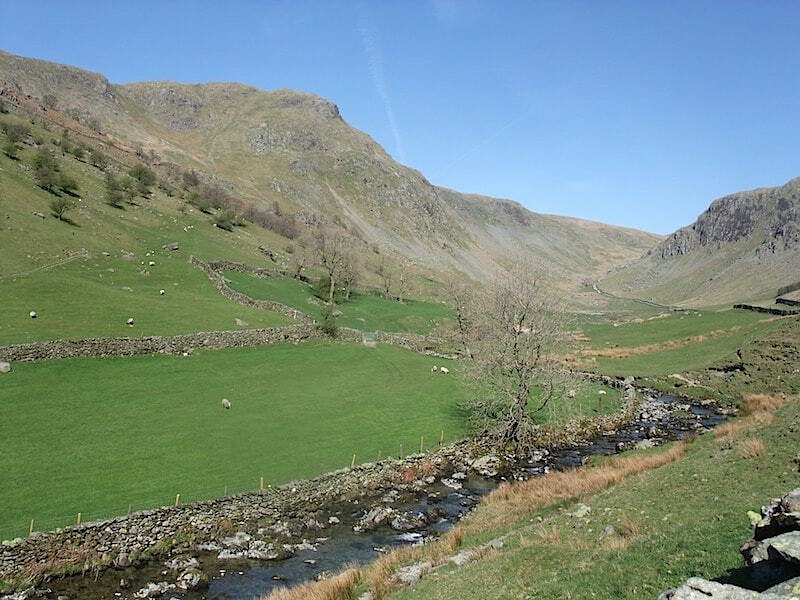 We decide on sticking close to home and having a walk on the far eastern fells, it’ll be quiet there won’t it, because everyone will be flocking to the well known tourist areas won’t they? Something went wrong with our thinking and on arrival at the little parking area at Sadgill we found the place packed and not a parking spot to be had. The only thing for it was to go back down the road a little way and find somewhere to park along there. 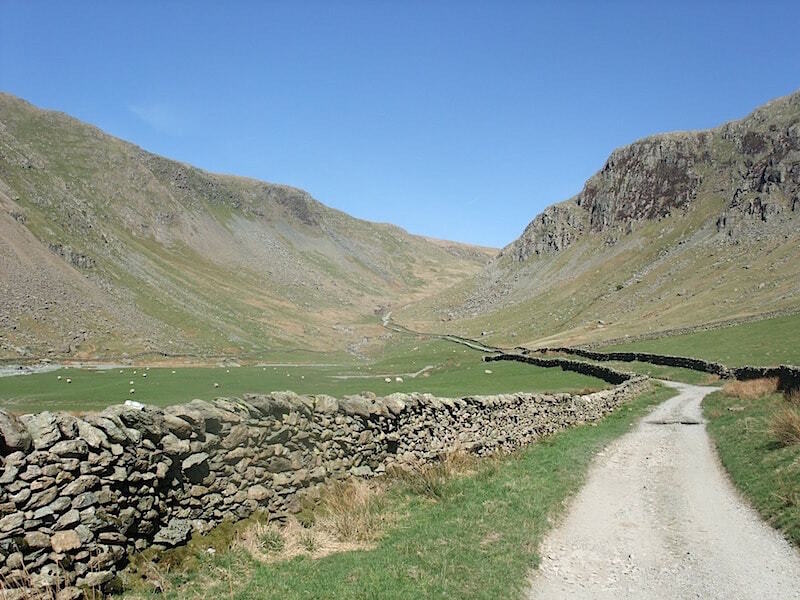 We eventually squeezed the car into a suitable gap and then made our way back to the little hamlet of Sadgill, in Longsleddale, to begin our walk. The view looking at our route ahead up Longsleddale, the River Sprint alongside us splashing its way down the valley and on towards Kendal. Its a long valley and the view doesn’t change much. 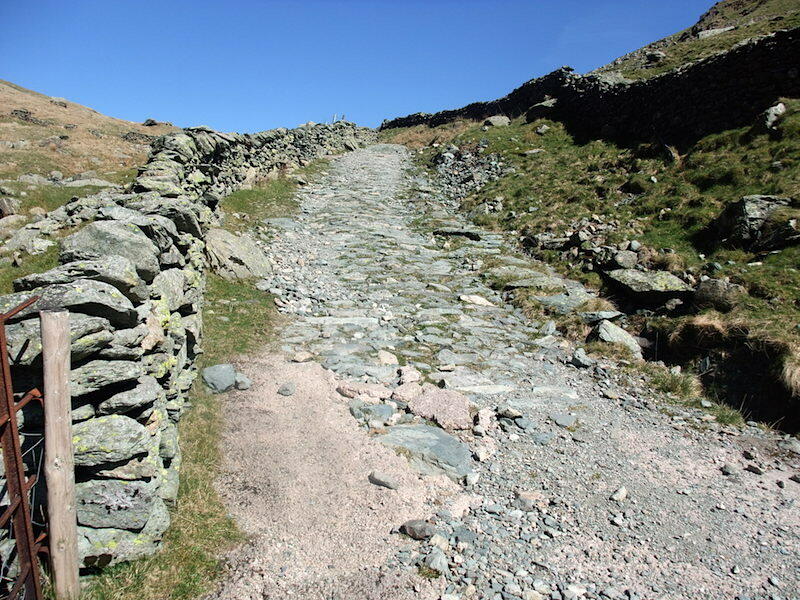 Its 4.25 miles from Sadgill hamlet to our first fell summit, which today will be Harter Fell but, as the photo shows, the route is fairly flat to begin with so the legs get a good chance to ease themselves gently into the walk. Further up the valley I take a look back at the river meandering its way along the valley bottom. The flat section is now well behind us and we are beginning to climb out of the valley. Its warm work with a hot sun on your back. We were the only ones on the path, so the occupants of all the parked cars must have decided to go elsewhere. Onwards and upwards, as the saying goes. 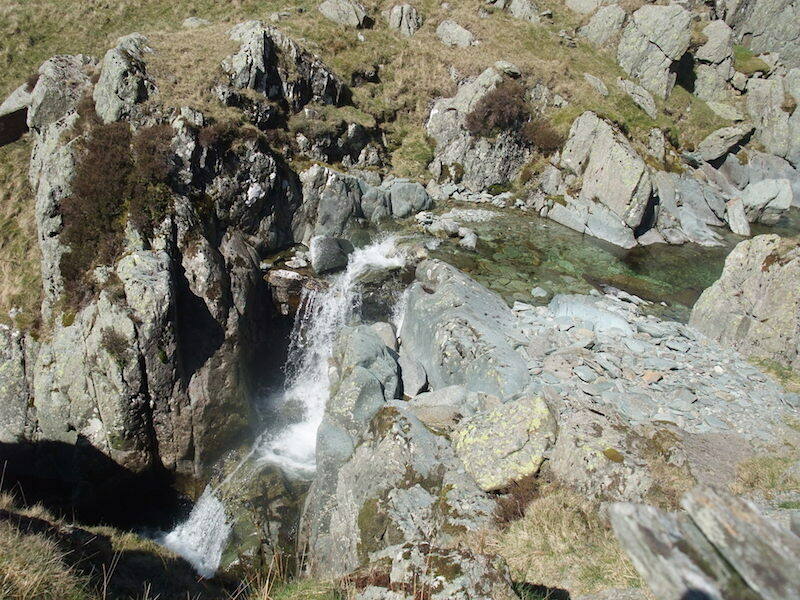 The path now runs close alongside the river, which drops to the valley floor in a series of falls …..
….. one after another …..
….. with occasional short flat sections of crystal clear water …..
….. before falling steeply yet again over another series of rocks. 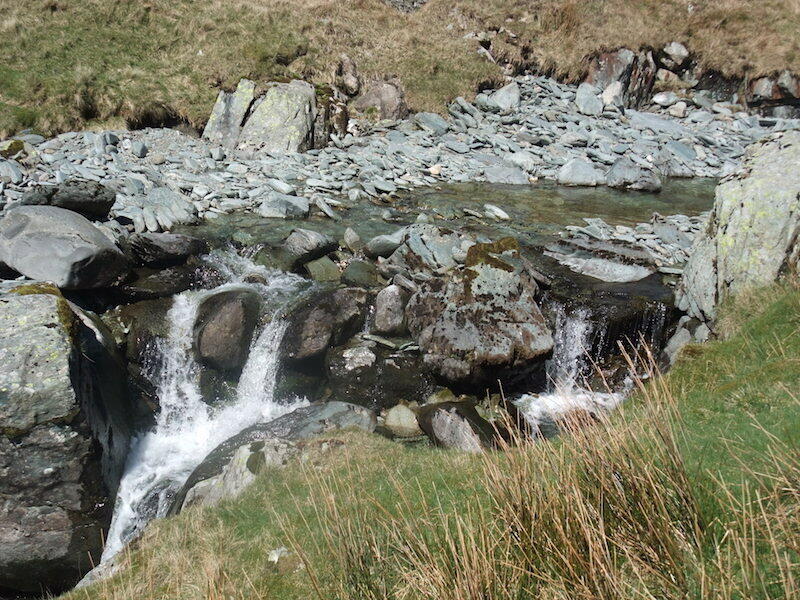 It starts high up on the slopes of Harter Fell so it has several hundred feet to fall before it reaches the valley floor. It looked so inviting, should we stop and have a paddle and a cool off? We decided against on the basis that we might not feel like getting going again if we did. A five minute stop at the bridge to take on more liquid. 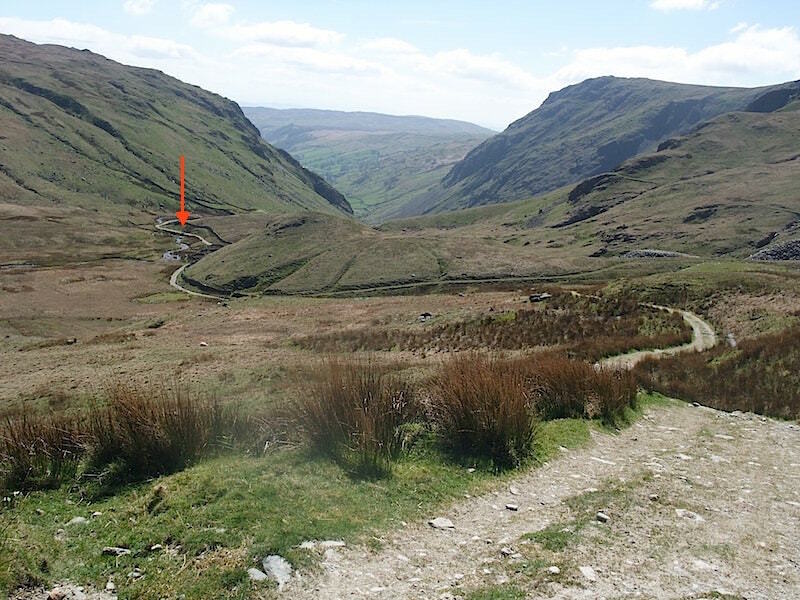 The bridge, indicated by the arrow, is now some way behind us and the gradient eased a little from that point. 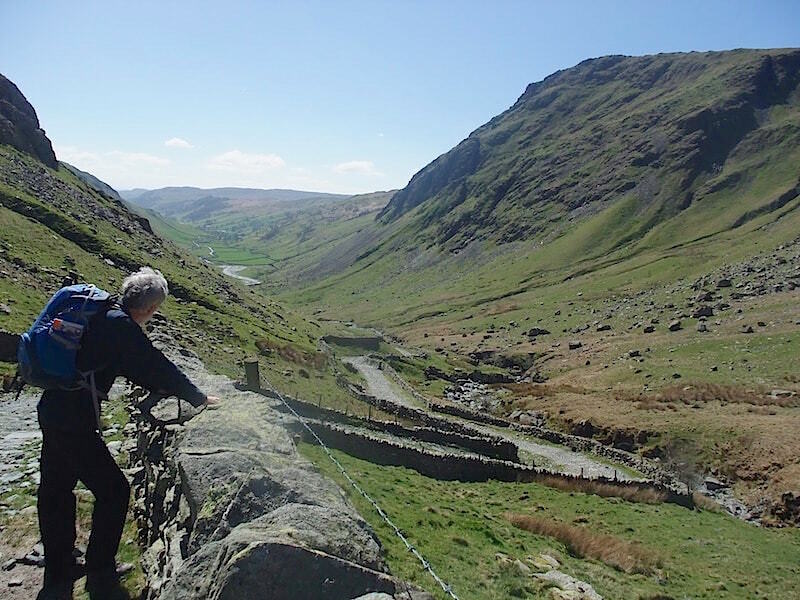 As you can see, the climb out of the valley up to the bridge is quite steep. 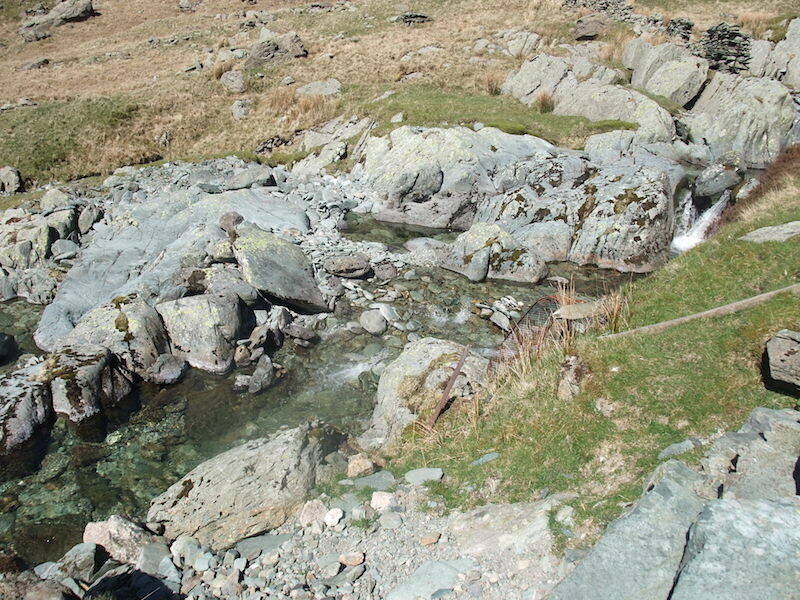 The path has now swung away from the river and we are now heading for the final pull up to Harter Fell. 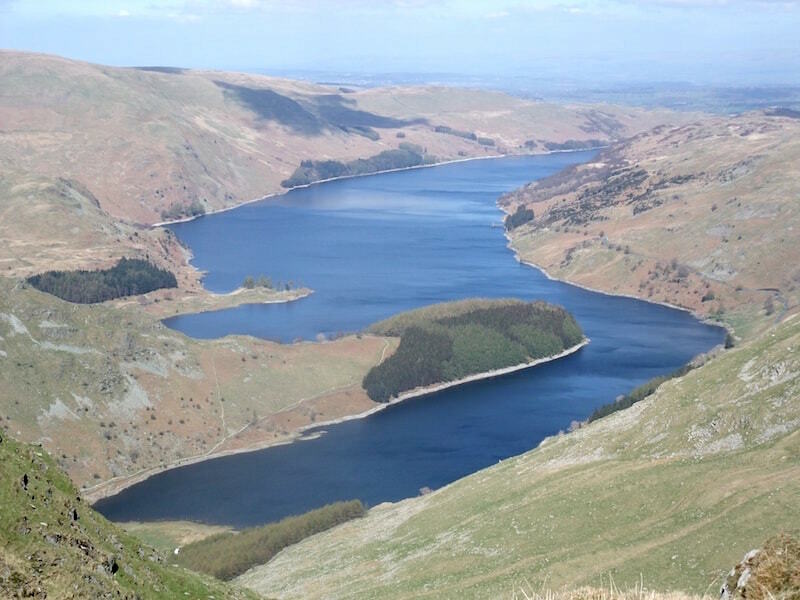 We’re up on the top of Harter Fell now with this fabulous view of Haweswater. We’ve really only just left winter behind so the landscape isn’t wearing its summer finery yet, but its still a lovely sight especially on such a sunny day. Adopting Wainwright’s pose at the big stone with the arrow carved into it, and the streak of white quartz running through it. 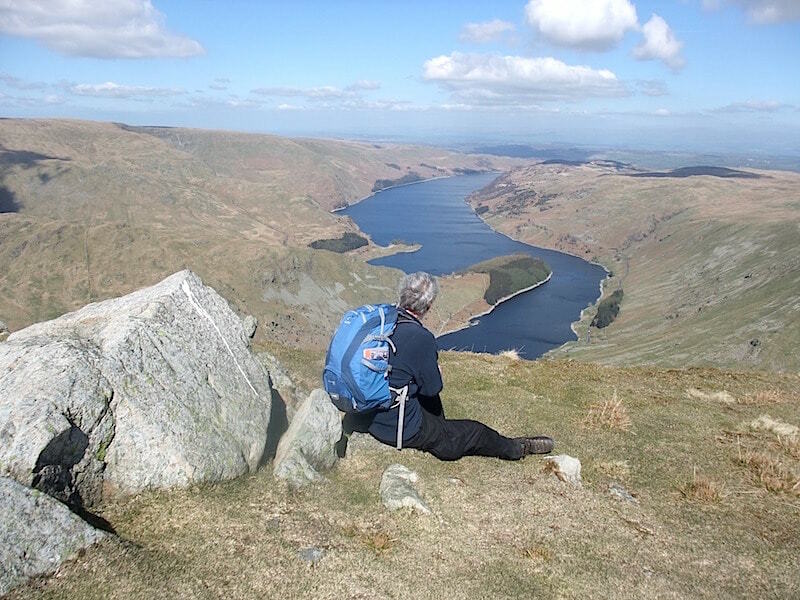 His drawing of himself sitting here admiring the view is to be found in Book 2, The Far Eastern Fells, Harter Fell page 10. 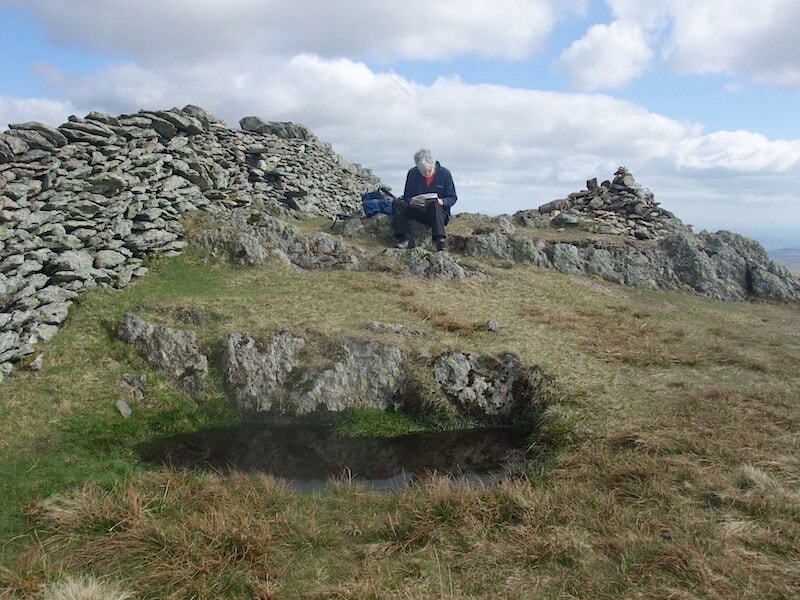 In the book he gave 14 pages of description and information about Harter Fell, including a full page drawing of himself and the view before him at this very spot. 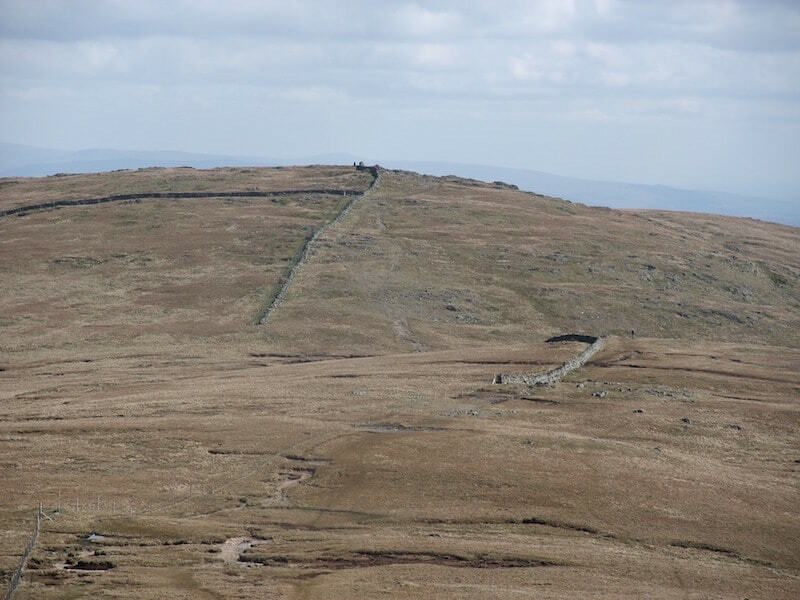 Harter Fell summit cairn, a jumble of stones and old iron fence posts. A look down at Small Water as we walk along the edge. 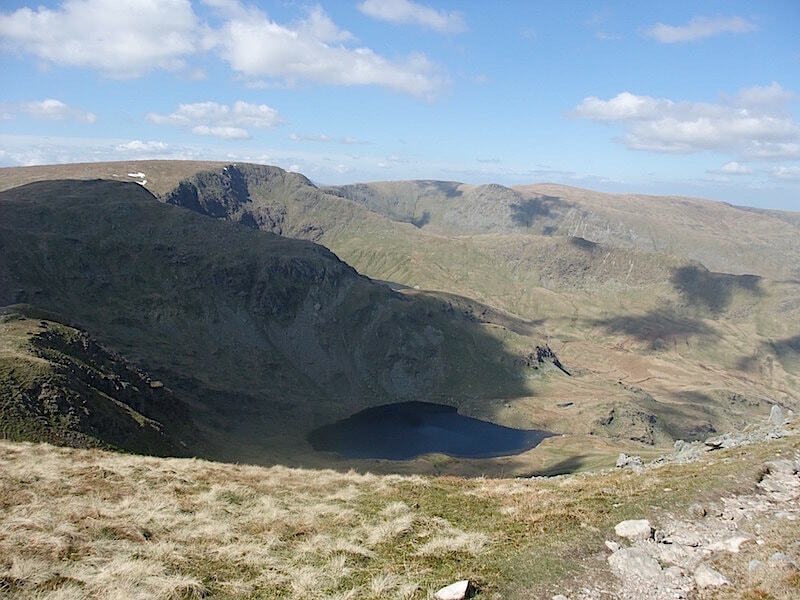 Just above it you can see a tiny section of Blea Water, which is a much larger tarn. 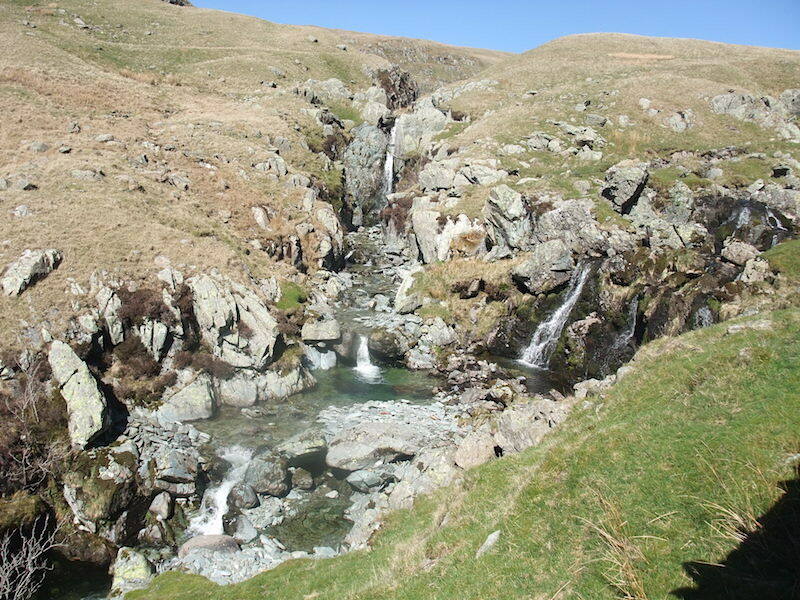 From Harter Fell we make our way over to Kentmere Pike. What AW describes as ‘a simple stroll on grass’, unless of course we’ve had a rainy period and then the peat hags can be a bit of a nuisance. 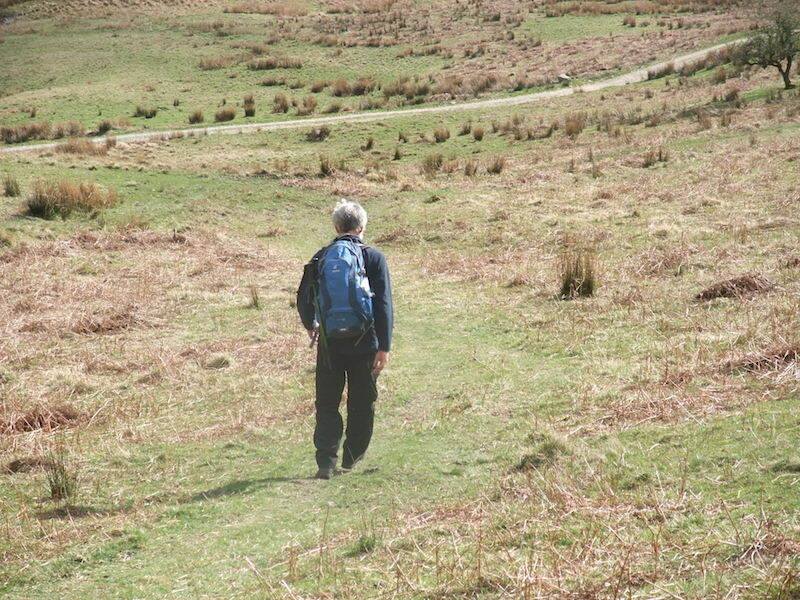 Its easy to navigate since you just follow the wall, the distance from Harter Fell to Kentmere Pike is 1.25 miles. 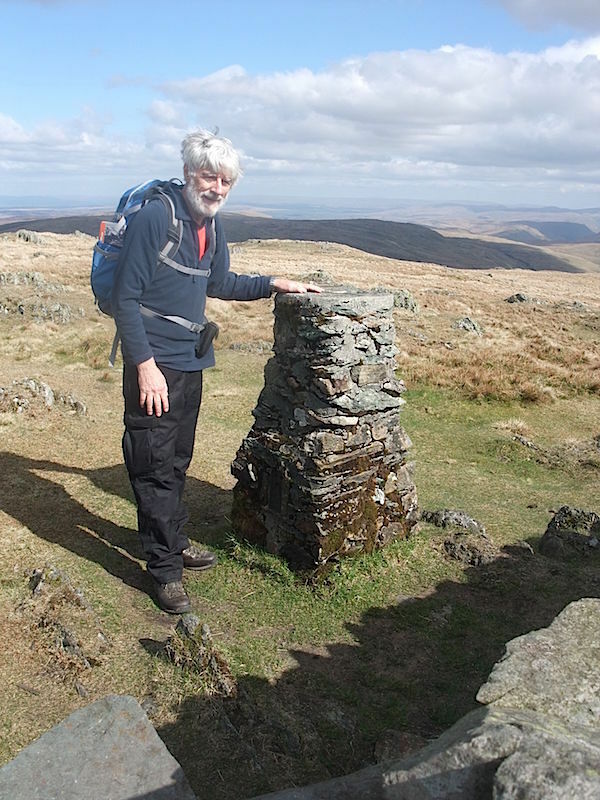 On the summit of Kentmere Pike for a sit down and a spot of map reading. The summit cairn over to the right. On the other side of the wall from the cairn is the trig point, a well made step stile is built into the wall so its very easy to get over to this side. 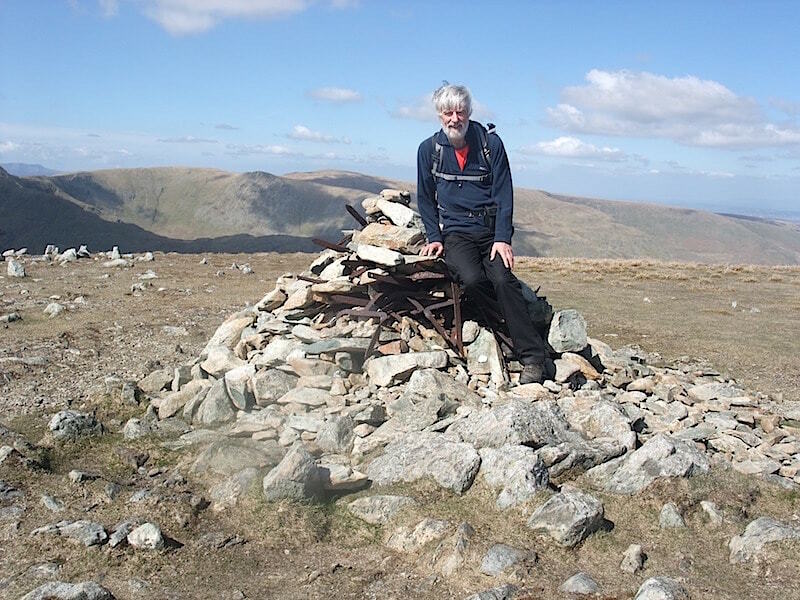 AW decided that both the cairn and the trig point could well have a legitimate claim to being the summit of Kentmere Pike. 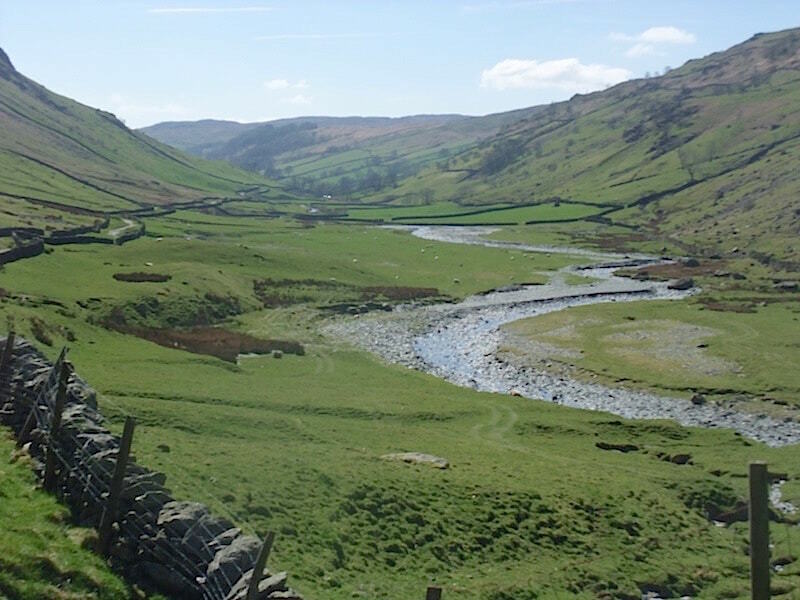 From Kentmere Pike we walked the 1.25 miles to Shipman Knotts. 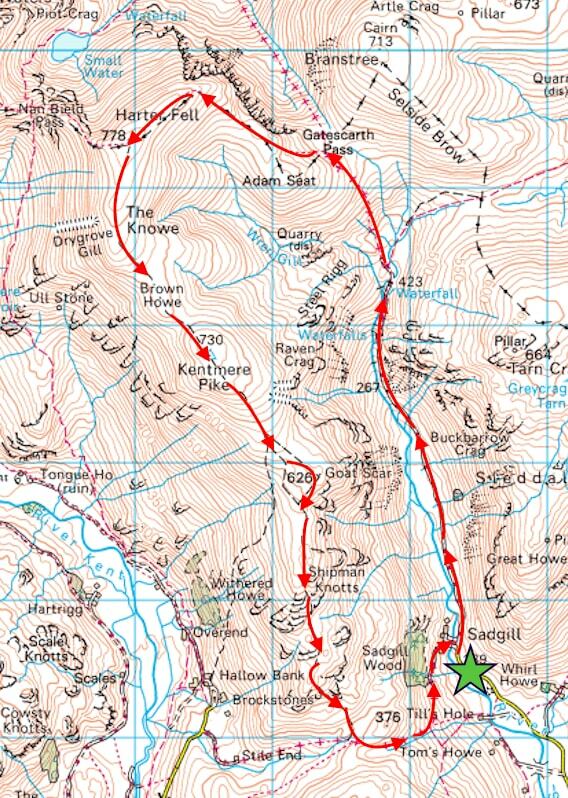 I must have fallen into a deep trance somewhere along the route as I have no pictures of anything along the way or the summit either. 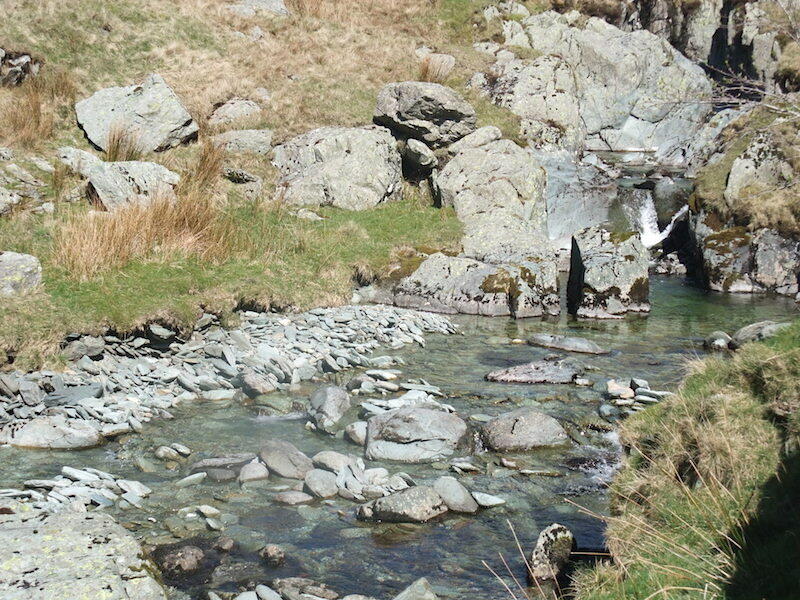 All I have is this shot as we reached the bottom of Shipman Knotts to join the path there below. 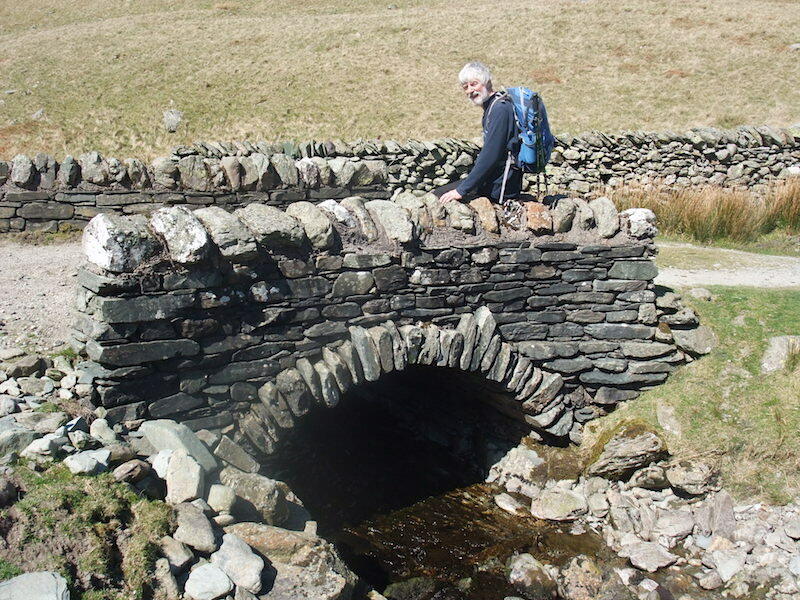 Once reached we take a left turn along the path which leads back to …..
….. the little hamlet of Sadgill and the bridge over the River Sprint. The car park has more spaces available now, but there are still a good number parked up whose occupants are still out somewhere enjoying their walk on the fells. 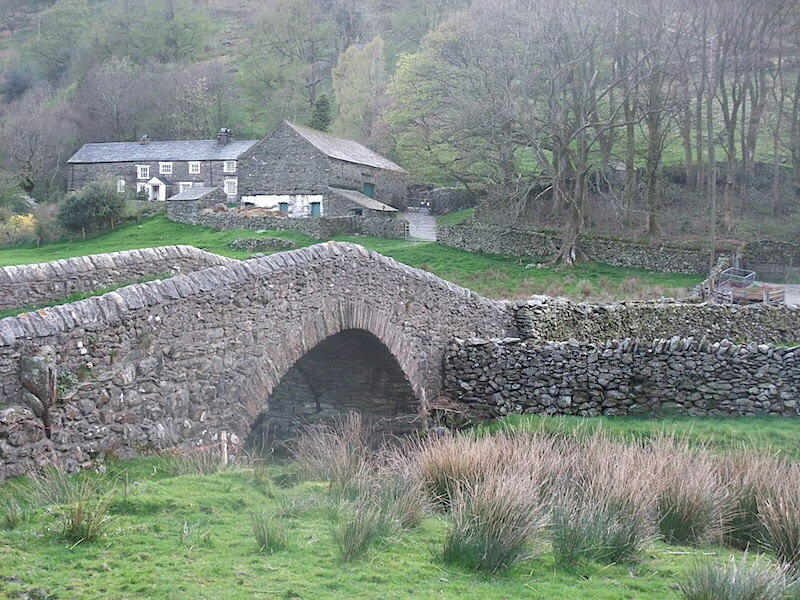 For us its a short drive back up the A6 and then home for a well earned cup of tea.